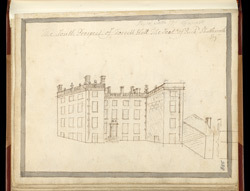 Sketch of an old house called Forcett Hall (North Yorkshire) from the first half of the 18th century. An early Georgian house was built here to a design by D. Garrett, who was a protégé of Lord Burlington, and favoured the Palladian style of architecture. However this house may predate the Garrett design. The Shuttleworth family purchased the manor of Forcett in 1582 and owned it until 1785.